More muffins! I've sure been on a kick of late. 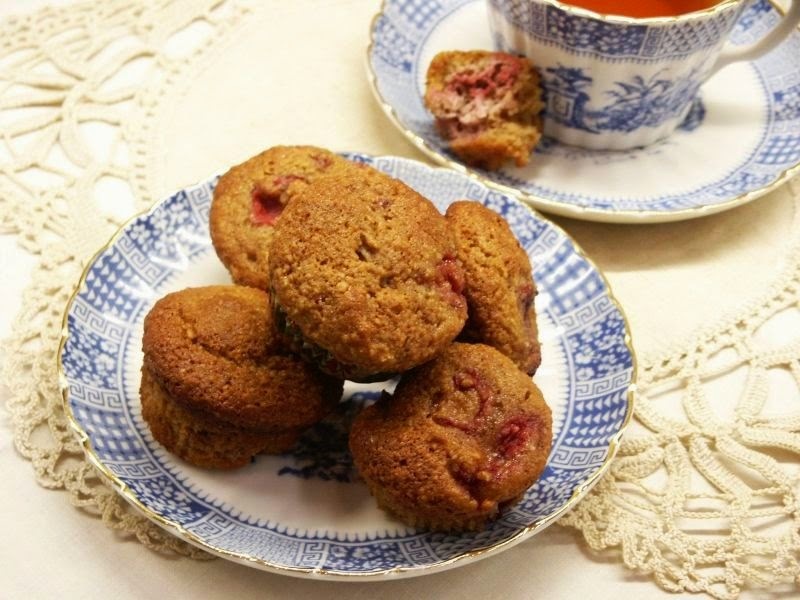 The great thing about these little muffins is they aren't too sweet. Just perfect with a cup of tea or coffee. If you have some not perfect looking strawberries left over, use them here. They get roasted and will be hidden in the muffins. I changed a few things....did not use mini chocolate chips as I wanted to keep it simple. You can add 1/3 cup of the little chips if you want. Frankly, I like the muffins without the added sweetness. Preheat the oven to 375'. Prepare a mini muffin tin with paper liners. In a large bowl, combine the almond meal, baking soda, coconut sugar and salt. In another bowl, whisk the eggs, olive oil, honey, almond and vanilla extracts together. Whisk until well blended and then add to the almond meal mixture. Stir. Fold in the strawberries. Fill the muffin liners to the top as they don't rise all that much. Bake on the middle rack for 16-18 minutes until the tops are golden brown and a toothpick poked in the center comes out clean. Cool on a wire rack. *For the Roasted Strawberries: Oven to 350'. Toss 4 cups quartered strawberries with a pinch of salt and 2 tsp. melted coconut oil (or olive oil works too). If your strawberries are sweet, leave them as is. If not, add some honey or a bit of sugar to sweeten. Spread them in a single layer on a parchment lined baking sheet. Roast for 25-30 minutes. Set aside to cool. I only used 2 cups of strawberries, which was plenty for this recipe. Silky, creamy, elegant and simple, all rolled into one pudding. And no sweetener. Really, it doesn't need any, it's perfect as is. There's a slight sweetness to the pudding, the coconut flavor shines through, the toasted coconut flakes supply a bit of crunch and you'll taste a little touch of nutmeg. It's a little gem of a recipe. Bring the coconut milk and almond milk to a simmer and whisk in the cornstarch and nutmeg, stirring constantly until the milk thickens. Doesn't take long. Remove from heat and strain the pudding through a fine mesh strainer. Stir in the vanilla extract. This recipe made enough for three of the dessert dishes in the photo. 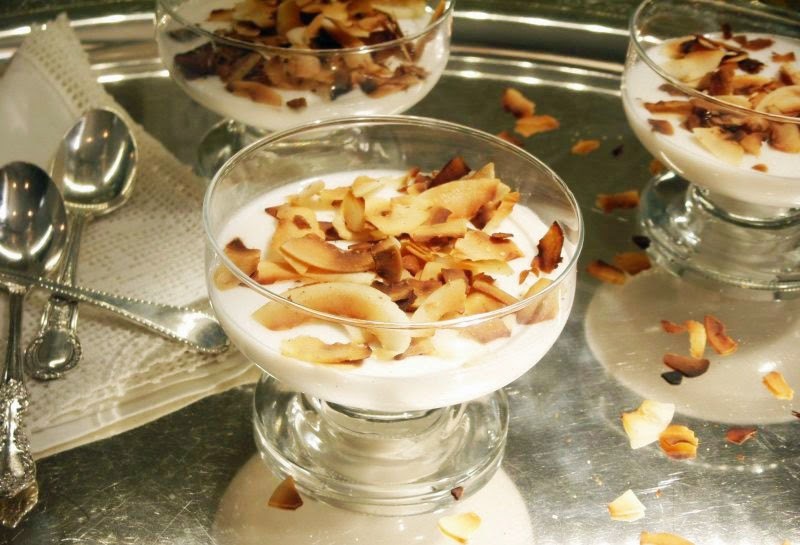 Divide the warm pudding and sprinkle on toasted coconut. You can serve warm, or chill, covered, for a few hours in the fridge. 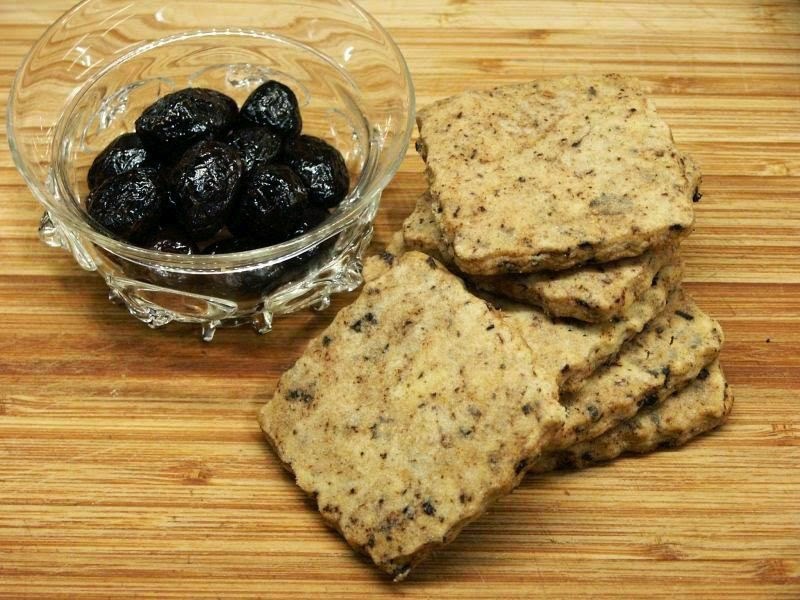 Very interesting recipe....a black olive shortbread. Savory, yes, but sweet as well. A sophisticated cookie for an adult palate, with EVO as well as black olives in the mix. Hard boiled egg yolks are a tenderizer. Added to a batter or dough the cooked bits interrupt the gluten network. Not so much that it doesn’t function, but enough that it’s more tender than it would otherwise be. Ground nuts do the same job, but if you want a lighter, fluffier texture, cooked yolk is a better solution. In addition, cooked yolk adds a pleasing yellow hue. (not noticeable in this recipe) You can add it to biscuits and pastry crusts as well. Whatever the means, the end results were intriguing and flavorful. This recipe doesn't make a large amount of cookies, but if you're having just a few people in for a cup of tea or a glass of wine, I got about 10-12 two inch squares with this recipe. I rolled the dough out between two pieces of wax paper and refrigerated it. 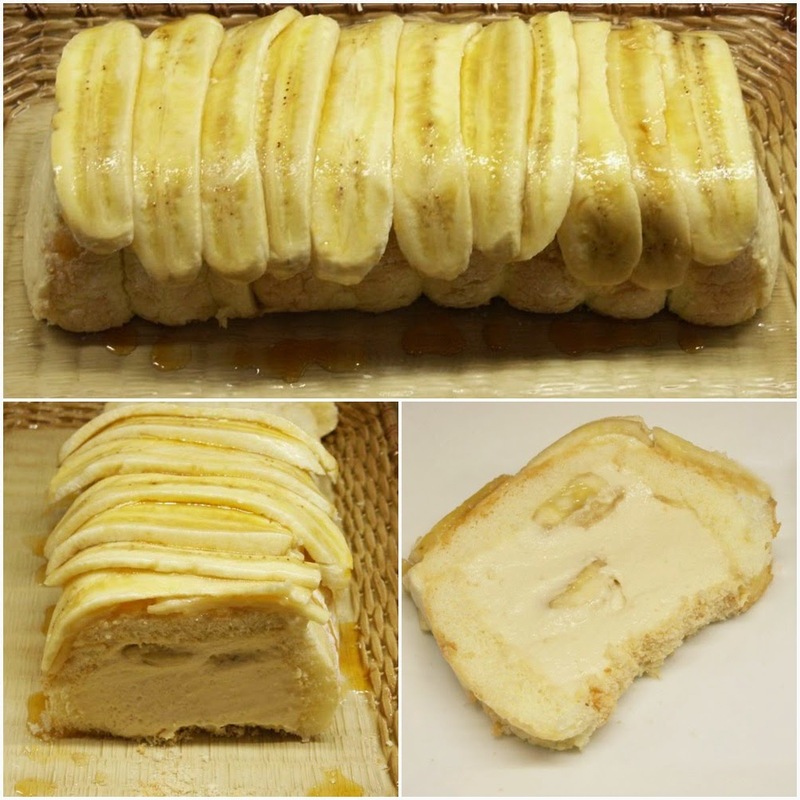 I bet if you formed it into a roll, refrigerated, then sliced, you could eke out a few more, avoiding scrap waste. Preheat oven to 340. Lightly beat an egg yolk and microwave it for 30 seconds until cooked. (Or use a hard boiled egg yolk) Press it through a sieve while still warm. In a mixer, beat the egg yolk, the butter, the powdered sugar and fleur de sel until creamy. Add both the flours and beat only until it just comes together. Fold in the black olives. At this point you can either roll the dough out between two sheets of wax paper (about 1/4 inch thick) or you can form it into a log. Refrigerate until firm. Cut with cookie cutter or slice the log with a knife and place the dough on a parchment-lined cookie sheet. Bake until lightly browned, about 12 minutes. "Run----don't walk---- to the kitchen to make this." Well...what more is there to say? Maida is my dessert guru and I have all her books; if she says it's awesome, I'm making it. The results? If you're looking to impress, this terrine will do it. Extremely rum-laden, which I love, but confess I amazed myself by actually cutting back on the amount. It was suggested 3/4 cup dark rum altogether and I reduced it somewhat, reflected in this recipe. It was still pretty strong, but perfectly balanced and delicious. Yes, it takes a little time, but you can do it the day before, a big plus. If you are familiar with Maida's desserts, you know her instructions are detailed and lengthy. I have trimmed them down as best I can, but if you don't have access to this particular book and need more information, email me and I'll email you her exact instructions (which actually took up 4 pages in the book!). Prepare a loaf pan, about 10 1/2 by 4 1/4 by 2 3/4, by lining the sides neatly with tin foil. I cut the short side to fit, then cut one narrow one for the long side. I turned the loaf pan upside down and fitted them over the bottom, one at a time, then flipped over the pan and dropped them in. Place the two bananas in the refrigerator. Cut one end of the ladyfingers so they stand flat against the sides and line both sides of the loaf pan (do not line the two short ends), with rounded side against the foil. Then line the bottom with ladyfingers, rounded side down. Set aside. 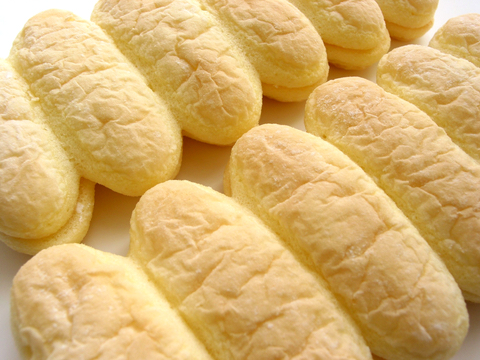 Take remaining ladyfingers and crumble them, stick them in a low oven to crisp them up. You will use them later. Sprinkle the gelatin over the cold water and let stand a few minutes. Then mix in 1/4 cup of the rum, reserving the rest. Let stand for 5 minutes, then place in a pan of hot water and stir until melted. Set aside, keep warm. In the top of a double boiler, off the heat, beat the yolks for a few minutes. Slowly add the sugar and beat on high. Put the pan back over the hot water and beat for another 3 minutes while it thickens. Immediately transfer to the bowl of an electric mixer. Beat in the warm gelatin mixture, the remaining 1/3 cup rum, the salt and the vanilla. Let stand. In a chilled bowl, with chilled beaters, beat the whipping cream until it holds its shape, but is not stiff. Set aside. Place the bowl with the egg mixture into an ice bath and stir until it thickens somewhat, about 10 minutes. Remove from the ice bath, but don't throw the ice bath out. Slowly add to the whipped cream and carefully fold until blended. Take the bananas from the fridge, peel and slice them into 1/2 inch pieces and add to the mixture. Place it back in the ice bath and stir carefully until it thickens a bit more so the bananas won't sink. Pour the chilled mixture into the loaf pan, smooth the top. My mixture came nearly to the top of the ladyfingers. Sprinkle with the reserved ladyfinger crumbs. This will help prevent sticking later when you slice. Refrigerate until firm, several hours or overnight, covered. If the mousse does not come up to the top of the ladyfingers, trim them so it's even. Cover the terrine with a long serving plate and turn it over. Remove the foil. Heat the preserves with the water and strain. Brush the top of the terrine with the preserves and set aside. Slice the remaining bananas sharply on the diagonal, about 1/4 inch thick, make them as long as possible. Overlap them on top of the terrine and finish off with more apricot preserves, which will prevent the bananas from turning brown. Refrigerate again until ready to serve. To serve: Serve with a dollop of sweetened whipped cream. While boxty used to be considered a peasant dish, it is now common to see it on menus everywhere in Ireland. 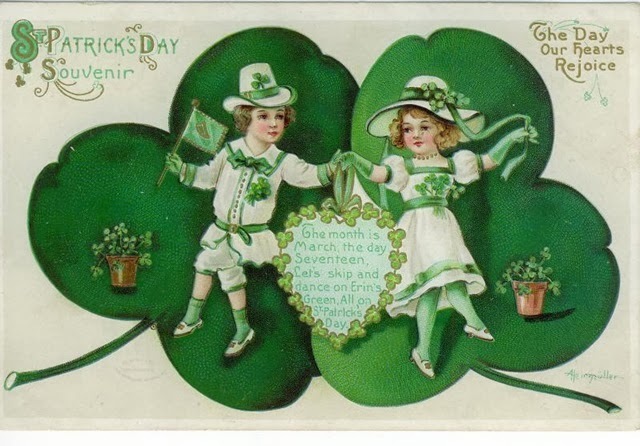 I'm joining Kathleen at Cuisine Kathleen, for her 6th Annual St. Patrick's Day event. Please stop by and see what everyone's doing! You'll never get your man. Place the grated raw potatoes in a clean cloth and twist to remove excess moisture. Whisk together flour, salt, and baking powder. Combine flour mixture into raw potatoes, mashed potatoes, and eggs. Add milk until you have a thick batter. Heat a heavy skillet over medium heat and add butter or oil. Drop potato batter by the tablespoon into the hot pan. 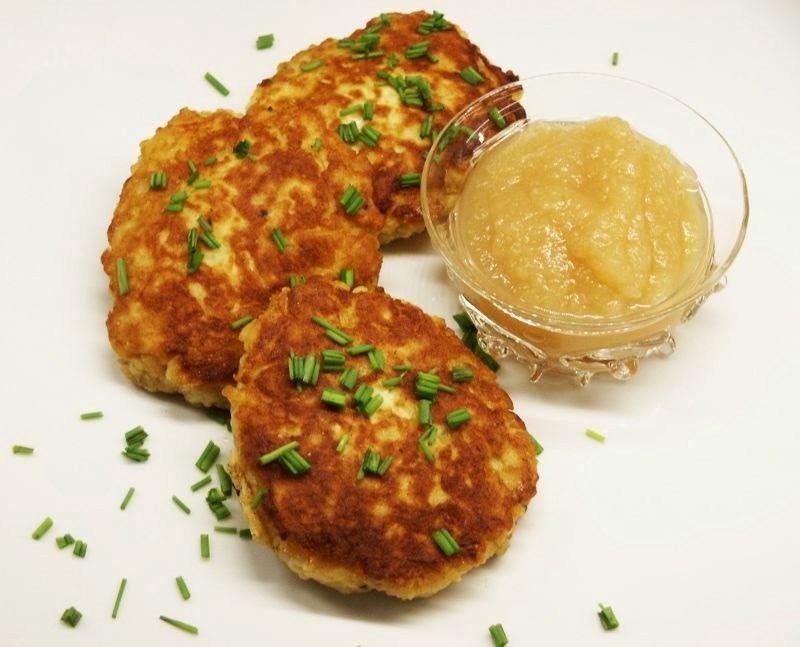 Butter each boxty and serve hot with applesauce or sour cream. You've gotta love the presentation here....and no, I can't take credit. Saw it on Pinterest and thought it looked delicious. Indeed it was. What a super idea for a light dinner or luncheon. Very clever and it combines some marvelous flavors and textures. I baked the salmon with some soy sauce, ginger and olive oil smeared on top, topped with salt and pepper. You can cook the salmon anyway you like and with any marinade you prefer. Place cooked sushi rice in a clear glass...I used brandy snifters, but any pretty clear glass will do. A variety of glasses might be fun too. Add nori over the rice and then the sliced cucumber. 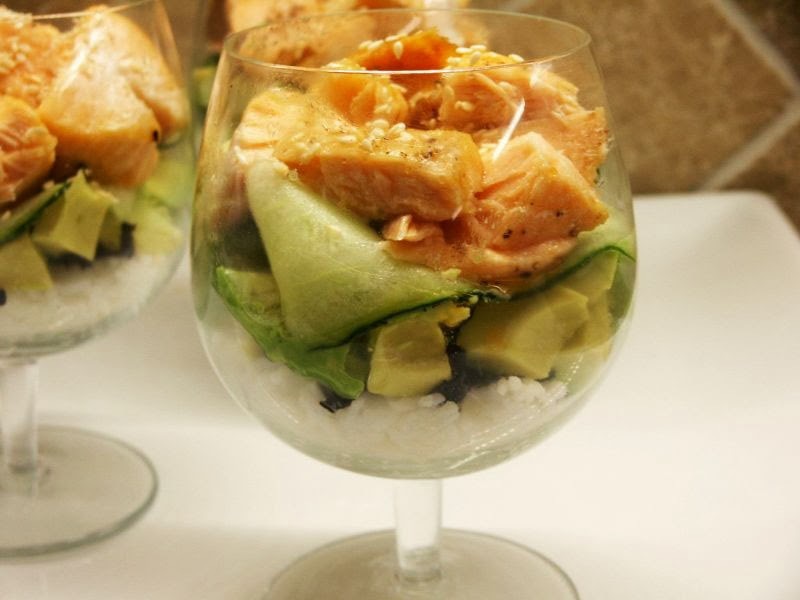 Top with avocado pieces and place the salmon on top. Mix together the wasabi sauce and soy sauce then pour over the salmon. Sprinkle with toasted sesame seeds. Welcome to another Ina First Friday. Desserts are the subject this month and I've chosen an old family favorite. My mother made it for us when we were children and I have her original recipe. The only change I've made over the years is I now bake the meringues, à la Ina, much simpler than poaching them in milk as my mother did. Besides, I love shaping the meringues into peaks which, when baked, are touched with a little color. Americans don't make this dessert much, unhappily. It was originally a French nursery dessert called île flottante: a single "island" of meringue floating in a "sea" of crème anglaise. Oeufs à la neige is another name used, indicating many small eggs floating rather than one large one. I have enjoyed this dish often when in France (where it is more commonly found on a dessert menu than in the U.S.); they usually serve a large square island floating in the crème anglaise. It makes sense for a restaurant to make portions in a large pan rather than individual "islands". The rare times I have found it on a menu in this country, they try to improve it with the addition of fruit; it doesn't work. Why mess with perfection? This dessert is better the way it was served in the nursery: plain and simple. If you're in a rush, skip the caramel. It's still ambrosial. Set the oven to 250 degrees F. Line 2 sheet pans with parchment paper. Mix 1 and 1/2 cups sugar with 1/2 cup water in a heavy-bottomed saucepan and bring to a boil. 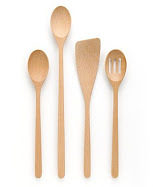 Stir with a wooden spoon and boil over medium heat until it turns a caramel color. Remove from heat and add another 1/2 cup of water and 1/2 teaspoon of vanilla. It will bubble up, so be careful. Return to the heat and cook until it reaches 230° on a candy thermometer. Set aside until ready to use. 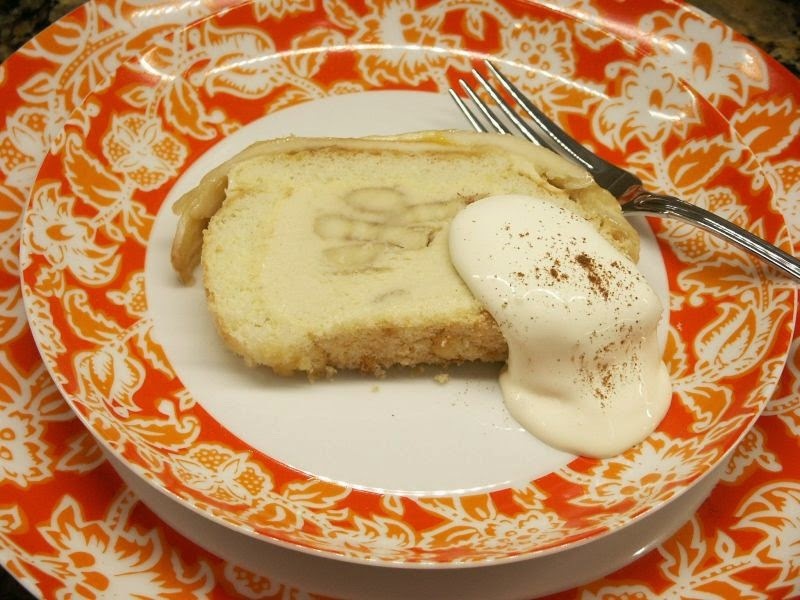 For serving, pour creme anglaise on the bottom of individual plates. 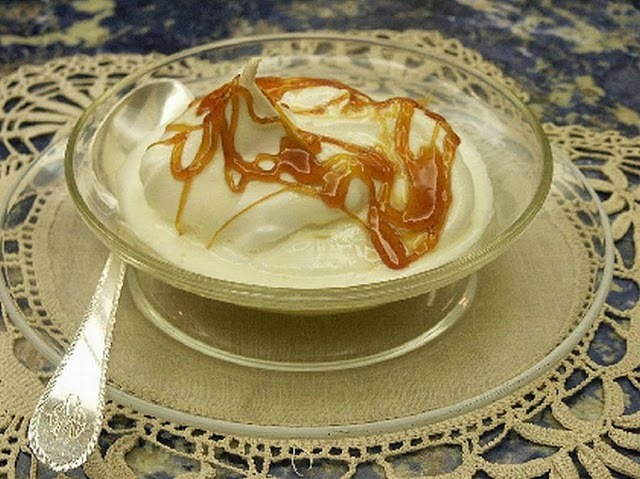 Place a meringue on top of each serving, drizzle with caramel sauce. You all know, I'm not a big bread-baker. But when I do, it's more often than not dinner rolls. I made these last Thanksgiving and never got around to posting the recipe. They turned out well, although not as picture perfect as the ones on the Sonoma webpage. Honestly, don't you sometimes wonder if they had to bake all afternoon to get those perfectly shaped and evenly browned rolls? I'd love to be behind the scenes on a shoot just to see what they do. Some of you have published cookbooks, what say you? Oh well, the house was fragrant with that lovely yeast aroma while they were baking and they were lovely and light. The touch of salt, garlic and onion on top was a great idea. I froze a batch too. 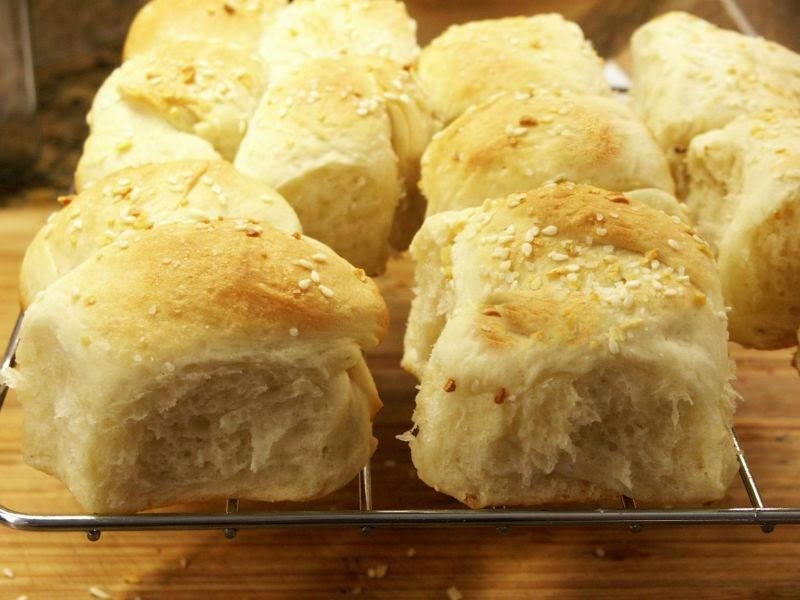 My old holiday standby has always been my recipe for cloverleaf rolls; time for a change. Lordy, I do love hot yeast rolls! In a small saucepan over medium heat, combine the milk and the 8 Tbs. butter. Heat until the butter is melted, about 7 minutes. Remove from the heat and let cool to 105° to 115°F. Add the yeast and stir until dissolved. Let stand for 10 minutes. In the bowl of an electric mixer fitted with the dough hook, combine the 4 cups flour, the sugar and kosher salt and beat on low speed until combined, about 30 seconds. Add the milk mixture and knead until the dough forms a ball, about 1 minute. Increase the speed to medium-low and knead until the dough is smooth and elastic, 4 to 5 minutes. Remove the dough from the mixer bowl, oil the inside of the bowl and return the dough to the bowl. Cover tightly with plastic wrap and let the dough rise in a warm place until doubled in volume, about 1 hour. Grease a 13-by-9-inch baking pan. On a lightly floured work surface, roll each piece of dough into a log 12 inches long. Using a bench scraper, divide each log into 12 equal pieces. Using the cupped palm of your hand, roll and shape each piece into a taut ball. Arrange the dough balls in the prepared baking pan so there are 4 rows of 6. Cover tightly with plastic wrap and let rise in a warm place for 30 minutes. In a small bowl, combine the Maldon sea salt, onion flakes, garlic flakes and sesame seeds. Remove the plastic wrap from the pan. Brush the tops of the rolls with the 2 Tbs. melted butter and sprinkle with the sea salt mixture. Bake until the rolls are golden and an instant-read thermometer inserted into the center of a roll registers 190°F, 18 to 20 minutes. Invert the rolls onto a wire rack, then turn them right side up onto another rack. Let cool slightly before serving. Makes 24 rolls.